The slimy Beech Tuft, affectionately known as the Poached Egg Fungus, scientific name Oudemansiella mucida, emerges from the heartwood of the trunk where it has likely lain dormant. The peculiar dark hue of the fallen logs points to this. An infestation of the living tree by air borne spores getting into a wound could cause the tree to tumble down in strong winds – all parts of Nature’s mysterious ways. “Every cloud has a silver lining” is a traditional British saying reflected here by the stormy weather this year when many favourite mature trees in Holland Park crashed down. Soon, fresh gaps became familiar views; logs rotted in artistic piles – testaments to those former glories. As Autumn arrives, however, sorrow for our fallen giants is replaced by a lightning jolt of wonder when the beech logs near the Northern Enclosure crosspaths magically sprout a truly spectacular display of shining ivory white fungi, a gleaming mass over the rotting logs, a lively resurrection. Thick tufts of elegant mushrooms, technically “sporophores”, with gelatinous caps, like lightly poached egg white in texture, with a diffused flushed centre, mature in varying stages, starting as a mass of pearl-like immature buttons pushing forth from the mycelium mass. The maturing spherical cap broadens out to a mutch-like shape, ragged at the edges and diaphanous like a small white jellyfish, flattening out further to a saucer-like shape. It is a beautiful clear white, the fawn held up to the light, hence its alternative name : The Porcelain Fungus. The veil enclosing the immature egg-like cap disintegrates leaving a slight ring around the tough, strongly rooted stipe, while the bone china white gills are widely spaced shedding white spores. The fungus will gradually break down the log performing its unique role, in its unique niche, in the ecological re-cycling by Nature. Another very beautiful fungus feeding off fallen elm appeared this autumn in Holland Park. The striking Rhodotus Palmatus is an unusual fungus, in a class all of its own. With an apricot-tinted cap, it looks like a soft, ripe apricot, from a distance, - and even has a distinctive perfume of apricots! The cap has an unusual detachable glutinous cover, wrinkled in a curious maze-like pattern. Strange rose-red droplets lied in tiny typical pittings of the cap and pinkish-white, often excentric, curved stripe. The spores are uniquely pink and spiny. As it matures, the cap lightens in colour, especially if washed out by rain, becoming concave, to resemble a pink palm, as its name reflects, from palmatus, Latin for hand-like. The outbreak of Dutch elm disease made this species relatively more common, but, as that habitat dwindles, this lovely fungus will, sadly become rarer again. Stunningly attractive fellow travellers appearing mysteriously in the moisture and warmth of sunlit groves in Holland Park to “walk with us” for some fleeting days along the same path of life, they are also both valuable companion rotters of the very best kind! NB : It must be stressed that eating fungi from the wild is potentially lethal so must be seriously avoided without truly expert identity guidance. The Borough, by which we mean largely the Ecology Centre, has been very busy drawing up management plans. While there is always a temptation to think that time would be better spent on practical matters, it has to be admitted that the Friends have long asked for better planning and therefore welcome this activity. We have been consulted on the draft of RBKC’s Local Biodiversity Action Plan 2007 - 2011. This is a document that descends from an international convention in 1992 via UK and England plans to Borough level and is concerned with maintaining and improving biodiversity of all life forms. There is an emphasis on native plants and it is true that aliens such as Japanese knotweed and grey squirrels can do immense damage, but, as any gardener knows, slugs are not particular about the provenance of their breakfast. So the contribution of a plant to biodiversity should be measured by its usefulness to other life forms: we can with a good conscience both plant native trees and expand our collection of exotics. The LBAP covers all parts of the borough, parks, woodlands, cemeteries, riverside, private gardens and waste ground but we are concerned with the first two. Habitat preservation and improvement is of the first importance to nurture desirable species. There is a clear message that biodiversity needs to be considered throughout our parks and not confined to designated “wild” corners. Hence the borough’s unwillingness to use weed killers and pesticides even in formal gardens. 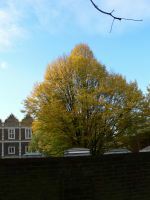 The borough produced a Tree Strategy in 2005 which has a brief section on trees in parks and especially Holland Park but for any detail we need to go to the HP Woodland Management Plan 2006 – 2011, covering the northern enclosures (but not the Oak Enclosure, the Arboretum or the path verges). This is still in draft form and a further Tree Plan has yet to be produced. The Friends have been consulted about the Woodland Management Plan and we are especially pleased to see that the draft acknowledges that one of the major objectives is “to preserve the tranquil and natural atmosphere of the park”. We are also pleased that, following our representations, it is now agreed that one of the historical reasons for the woodland creation, namely screening from the world outside the park, is still relevant. This is especially important in view of the uncertainty regarding the school site and other developments. The draft includes “prescriptions” for managing each enclosure, thinning some, thickening others, maintaining on the whole desirable exotics within them but removing invasive species and planting natives. Meanwhile the borough has employed an expert in tree health to survey all trees above a certain girth, GPSing their positions and reporting on their condition. It is from his recommendations that the Tree Plan will be created. His work is driven by safety considerations. We must bear in mind that many of our mature trees were planted about the same time and are now coming towards the end of their lives. This is especially true of the horse chestnuts many of which are showing signs of bleeding canker for which there is no cure and which leads to death within a few years. Inevitably he will recommend the felling of a number which he does not consider safe. When we include those gaps where trees have been blown down in recent gales, it looks as if there will be a good number of replacements needed and the park will be grateful for gifts of trees. To ensure that these contribute to the overall structure of the park, it has been agreed that we will draw up a list of required species and locations and donors will be invited to choose from that list. Native trees for the enclosures are likely to include hornbeams, sweet chestnuts, sessile oaks and broad leaved limes. There will be scope for exotics along the verges and maybe in the Oak Enclosure and the Arboretum. Horse chestnuts are unlikely to be approved while the leaf miner is so disfiguring but many chestnuts are distasteful to the miner including the fast growing and very decorative Indian Horse Chestnut. The borough has procured a handsome book with loose-leaf pages where donors can have gifts recorded with details of names and occasions as they desire. The plan is to have it on display in a glass topped case, where one page at a time can be seen by the public, perhaps in the cafeteria or park reception, and from where requests to see specific pages can be allowed. The Friends’ contribution to all the planning has been advisory but we have also done practical work on trees this summer, mainly in the form of producing a tree walk booklet in conjunction with the Ecology Centre and with input from other borough departments. This is a handsome production that will be on sale from the park open day on 2 September. The core of it is a self guiding walk formed from a list of 48 notable trees. Each tree is marked on a map and has a drawing of a typical leaf and sometimes another feature. The drawings are by a professional botanical artist, Nina Barranca, who is also a Friend; we are sure you will all admire them for both accuracy and beauty. Letta Jones, a garden historian, has written an historical introduction linking past plantings with the topography of the park today. Rhoddy Wood, advised by Dr Alan Harrington, has provided descriptive paragraphs for each tree. The Friends have borne most of the cost of producing the 36 page booklet but decided we were doing it as one of our aims - “to educate the public in the history, natural history and other aspects of the park”. To enable it to reach the largest possible readership, we are therefore selling it at the heavily subsidised price of £2.00. Please do support us by buying a copy and then have fun using it. A Friend, Andrew Whiteley, is making a check list of all the tree species in the park. He has read all the back issues of the newsletter and received botanical and historical guidance from Alan Harrington and Rhoddy Wood. An enormous amount of work later, his database is nearing completion. It now contains approximate locations for more than 400 named trees from about 250 species and a few more whose identification is not yet certain. He is passing this to the Ecology Centre where it can be used in conjunction with the Tree Plan. Finally, Dr Prabha Patwardhan, a visitor to the park from another continent, was so intrigued by our trees that she has written her own guide, saying it is for her family’s use. This has been a major undertaking for her. She describes walking along different borders and saying what trees and other plants are in them and also has a section describing individual plants. She plans to add some of her own photos. Because she claims to be a beginner writing for beginners, she does not always give the species but Rhoddy has checked the genera for her. We are delighted by all this interest our trees arouse. One of the delights of walking in the park is never knowing when something new will turn up. So the participants on one of Alan Harrington’s tree walks on the West Lawn gazed in amazement at a large shrub covered with red and yellow velvety fruit like lumpy misshapen pears. In the excitement of the moment someone even suggested cashews. Though this was quickly withdrawn, it does show how we believe anything is possible in Holland Park. Luckily someone was able to take samples to the Chelsea Physic Garden who identified them as the fruit of the Wintersweet, Chimonanthus praecox. This is one of those old fashioned sounding plants which we feel we ought to know but can’t quite remember. We must try to get back in winter to see its sweetly scented, pale, waxy-yellow flowers. Much more recently planted was a bush on the Peacock Lawn making a mound which in July was covered with white flowers with purple stamens. This a Lacewood from New Zealand, probably Hoheria lyalli. Bark on mature trees makes a lacy pattern of brown and white. There is also a new tree between the sandpit and the tennis courts which could easily be mistaken for a tree of heaven, Ailanthus altissima, and indeed was known as A. flavescens when introduced in 1862. It was only when Andrew Whitely asked Rhoddy to check it that she noticed the leaflets did not have the diagnostic tooth on the shoulder and realised that it was Toona sinensis or Chinese Cedar, a rare tree in this country. It is related to the Australian Red Cedar, T. australis and the West Indian Cedar, Cedrela odorata. They are none of them cedars as we use the name but are all good timber trees as might be expected of the mahogany family. Wood from the West Indian one is used to line cigar boxes because of its aroma but the Chinese eat the young shoots and leaves of ours for the onion flavour. Once established it should produce long plumes of fragrant white flowers which ripen to woody seeds. C. odorata seedlings can be invasive in warmer climates. Readers of the summer issue will remember that we were hoping to be given black poplar cuttings to be planted in the park. This is now confirmed for about 11.00 am on Monday 5 November. To honour the return of this native, do come to watch the unusual planting method. We will gather at the bottom of the sports field near the Commonwealth Copse. Swift boxes If you have passed by the clocktower above the mural arcade in the early morning or evening this summer, you may have been mystified by the distinctive sound of swifts flying overhead while being unable to see them. It is all part of an experiment to attract swifts to nest in Holland Park. Suitable nesting sites are now in short supply in London and swifts need encouragement to try new locations. Nesting boxes have been installed within the clocktower. To attract passing swifts to come down and have a look, recorded swift calls have been broadcast from the clocktower. It may take several seasons to judge whether the experiment has worked, but now you are in the picture you too will be amused to see people staring up into an empty sky, baffled as to where the sound is coming from! Ian Thomson showed us three newspaper pictures of our heron in the Kyoto Garden. We would have liked to reproduce them for you but the copyright is with Reuters whose fees are beyond us. The first showed the heron alert on the bank, the second in the water with his beak enclosing a koi carp and the third with his head up, the fish firmly held and about to be swallowed. It is difficult to tell exactly how large the fish was but certainly no minnow. We still believe that the largest size we have of koi carp is too big to swallow but we many have difficulty in growing fish to this size while the heron is around. Never say this newsletter has no influence! In the last issue, we wrote about how we hoped to replace some of the hybrid poplars lost in the January gale with native black poplars. One of our members copied this to a black poplar enthusiast who regularly roots cuttings and has now offered us at least one young tree together with information and advice. He listed an impressive number of prestigious sites, including Hyde Park and Buckingham Palace, where his trees had grown and flourished. It seems that the native is not so dependent on a moist site as we had thought but does like an open position. So positions in the woodlands would not be suitable but the edge of the playing field would be. Our first choice will be at the bottom of the sports field where in time it will grow to screen whatever is erected in place of, or in addition to, the Commonwealth Institute. He huffed and he puffed and he blew the house down – or at least 90 mile gusts on 18 January blew down a number of trees; Kew and Holland Park were both closed for fear of accidents. We lost seven large trees, all uprooted and displaying surprisingly small basal plates. Perhaps the saddest casualty was not one of these but a Hupeh crab damaged by a falling Robinia; the crab has had to be trimmed to a bare trunk of maybe twenty foot. Before that its white cloud of blossom peeped over other trees surrounding the West Lawn and was just visible from the steps to the Kyoto Garden. It was unusually tall for a Hupeh crab (the two by the Kyoto Garden entrance are of a more standard size) and Alan Harrington had recently suggested we should investigate whether it qualified as a champion tree. No more. We can only hope the stump may sprout. Otherwise the trees that fell were two chestnuts and four hybrid black poplars. All were very large mature specimens and, though it is always sad to lose such, it is nature’s way of maintaining biodiversity in natural woodland. The gap created allows sunlight in so that it is first filled with herbs and wild flowers and then new seedlings can grow up creating the next generation of trees. In the artificial conditions of heavily used parks this doesn’t quite work and we usually plant young trees directly. We would like to put in a plea that some of these new trees should be Black Poplars, Populus nigra ssp betulifolia, our native wild poplars. There are thought to be about 6,000 left in Britain of which only one, in Kensal Green Cemetery, is known in the Royal Borough. From 1750 onwards, crosses have been made with the North American Eastern Cottonwood, P. deltoides and their varied offspring are called collectively Hybrid Black Poplars. The hybrids are preferred for quick screening because they grow slightly faster and can reach a slightly greater height, up to 40 metres, but the true Black Poplar is not far behind, is leafier, more graceful and has more presence. Nearly all Black Poplars are male and therefore do not clog the air with fluff in summer. It is surprisingly easy to distinguish the true Black Poplar from its hybrids even in winter – the leaves are not much help being similar and variable. The native has a short, grey-brown bole, the corrugations in the bark overlaid with many bosses. The numerous branches arch downward and bear rising shoots. (See illustration.) They are often infected with spiral galls. By contrast many of the hybrids have tall pale grey boles without bosses so that the fissures in the bark show clearly and one can see that a slice of the trunk would resemble a cogwheel. On a mature tree there are only a few high sharply ascending branches and they can be nearly as fat as the trunk. They do not have spiral galls. There are a number in Holland Park. Incidentally, Lombardy Poplars are a selection from our native tree, not a hybrid, and therefore do have galls. Following our long hot summer of drought, autumn came early in Holland Park and with it many weeks of leaf clearance. The borough has imposed a ban on the use of mechanised blowers in the park (to minimise noise and pollution) and so we are back to using brooms to clear the paths. For weeks this seems like a never ending task and we pray for strong winds to bring down the remainder and help us win what seems like a losing battle! Much more excitingly, in October last year we started work on the planting of a native hedge to run along the eastern perimeter fence of the playing field. Initial preparation involved the use of a mini-digger to create a deep trench 144metres in length. A ten ton load of finest, composted manure from Somerset was then shovelled into the base of the trench so that once planted, the hedge roots will quickly reach this supply of organic rocket fuel. Having done some research on native hedges, I then chose to plant what is known as a “Hedge with Two Faces”. This is a staggered, double row of whips with a single species (Hawthorn) planted along the inside “face” nearest the chestnut fencing. This will be easier to maintain and keep trimmed for a neat appearance. The outer “face” is a mixture of nineteen different native species such as birch, crab-apple, dog-rose, elder, wild cherry and field maple, many producing nutritious berries to attract birds. This face will be left to grow less formally, allowing the plants to develop in their natural habits creating a soft, natural effect as seen in rural areas. After a couple of years, the hedge will screen the playing field, soften the view as one walks up from Earl’s Court Gate and most importantly, create some prime real estate for birds, bugs and small mammals – giving us a gold star for improved biodiversity and hopefully a lot of fun for us all watching it grow. Happy Gardening and don’t forget to check out www.videojug.com/gardening for the latest films from Holland Park including yours truly “Planting Snowdrops in the Green”. Please contact Rhoddy Wood if you would like to see a complete list of the hedge species.